RSRR 2016, PARIS, June 28, 2016 - AdaCore today announced the publication of AdaCore Technologies for CENELEC EN 50128:2011. Authored by AdaCore expert Quentin Ochem and CERTIFER safety assessor Jean-Louis Boulanger, this booklet summarizes the EN 50128 railway software standard and explains how the Ada programming language and AdaCore’s products can be used to meet its requirements throughout the software life cycle. 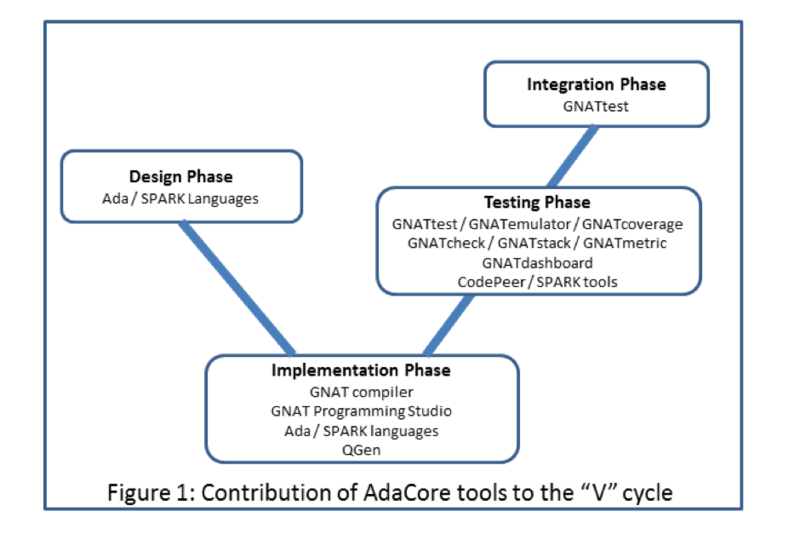 These tools fit into the “V” software life cycle as shown in Figure 1 below. AdaCore products have been used in a variety of safety-critical railway systems and, as explained in the booklet, various tools have been qualified as T2 or T3 tools, and several run-time libraries have been certified at SIL-3 / SIL-4 levels, under EN 50128. The AdaCore Technologies for CENELEC EN 50128:2011 booklet is available now, at no cost. To obtain a copy please contact info@adacore.com; it is also available for download from http://adacore.com/en-50128.